Waffle House Founders Die Less Than 2 Months Apart : The Two-Way Joe Rogers Sr. and Thomas Forkner Sr. co-founded the Waffle House in an Atlanta suburb in 1955. A statement released by the company says Forkner died on Wednesday at age 98. Rogers died March 3 at 97. 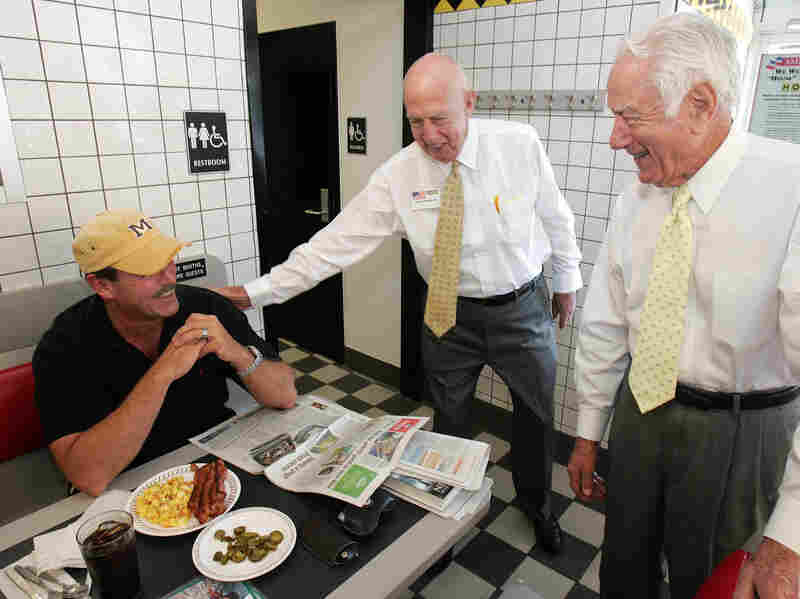 Waffle House founders Joe Rogers (center) and Tom Forkner (right) greet longtime customer John Webb as they stop for a meal at a Waffle House restaurant in Norcross, Ga., in 2005. In 1949, Thomas Forkner Sr. was in the real estate business when he helped Joe Rogers Sr. buy a house. Rogers was working for the Toddle House restaurant chain and he convinced Forkner to join him in starting their own restaurant. The two opened the first 24-hour Waffle House on Labor Day in 1955 in the Atlanta suburb of Avondale Estates. By the time they sold the business in the late 1970s, the chain had grown to 400 restaurants. The Atlanta-based company that owns the chain now has more than 1,500 locations. Waffle House said in a statement that Forkner died Wednesday at age 98. Rogers died March 3, seven weeks before Forkner. Rogers was 97. On March 4, Forkner's wife of 71 years, Martha, died. They got married 90 days after dating, according to Forkner's obituary. "Forkner was known to drop by the company headquarters regularly, up until a few weeks before his death. "He would often drive there to have lunch with new manager trainees, said Waffle House Chairman Joe Rogers Jr., whose father started the company with Forkner.
" 'Tom and my father had a handshake deal, and their partnership and friendship continued for more than 60 years,' Joe Rogers said in a statement." Forkner was also an avid golfer. He was listed among the top 10 senior golfers four times by Golf Digest.